I am fascinated by the concept of the On In Beauty system, a new beauty care regimen that combines an external moisturizer with a daily supplement to maximize its effects. Both products in the system contain Lutein, an antioxidant found in marigolds that may help improve overall skin elasticity and hydration. We all know that true beauty comes from within, so it makes sense to deliver nutrients to your skin from the inside out. Of course, moisturizing externally is just as important to maintaining beautiful skin, which makes this system the perfect combination. 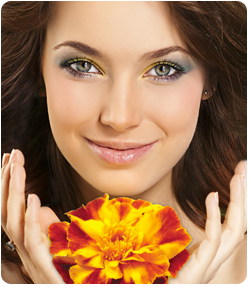 As mentioned above, the main ingredient in the On In Beauty System comes from marigolds. Lutein not only rejuvenates skin by improving elasticity, it also provides some protection from the sun’s UV rays. If you’ve been paying even an iota of attention to skin care news over the last few decades, you know just how damaging the sun’s rays can be to your skin. Excessive exposure can cause premature wrinkles, dark spots, and other unpleasant conditions. While nothing short of staying out of the sun completely will eliminate the risk, and sunscreen is still your best defense for those days that you do have to venture out, lutein can help absorb some of the rays and reduce their damaging effects. However, the human body doesn’t make this antioxidant on its own, so we have to get it from external sources. If you’re picky like me and leafy green vegetables have never found a spot on your plate, supplements are pretty much your only option. Taking lutein internally and applying it externally as well may help boost the overall effectiveness of the antioxidant. Walmart has a new online contest called “Get on the Shelf,” in which products compete against each other for a spot on the shelves of the retail chain, and On In Beauty needs your help. The public gets to decide which product should receive placement on Walmart.com and their shelves, as well as other fringe benefits like marketing advice. Voting is already in full swing and ends on April 3rd, 2012 so head over and vote for On In Beauty. 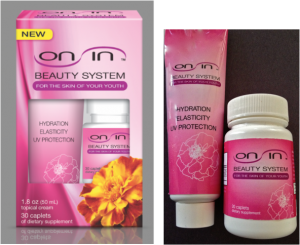 The On In Beauty System doesn’t start shipping until early May, but you can pre-purchase it now and save $10 off the $29.99 price. That’s a 33% savings. This offer is available to residents of the United States and Canada.